There is no question that the greatest auteur of the second generation of Japanese indie animators is Kōji Yamamura (山村浩二, b. 1964). Not only has he been producing top notch animation since the early 1990s, but as a professor at Tokyo University of the Arts (aka Geidai) he is nurturing current and future generations of animation talent. His renown has attracted not just the cream of the crop from across Japan, but also talented young animators from China and South Korea who want to follow in his footsteps. Nguyen chose to end his RICA programme with Muybridge’s Strings, a film that Nguyen felt has been underrated compared to highly favoured works like Mt. Head (2002) and Franz Kafka’s A Country Doctor (2007). 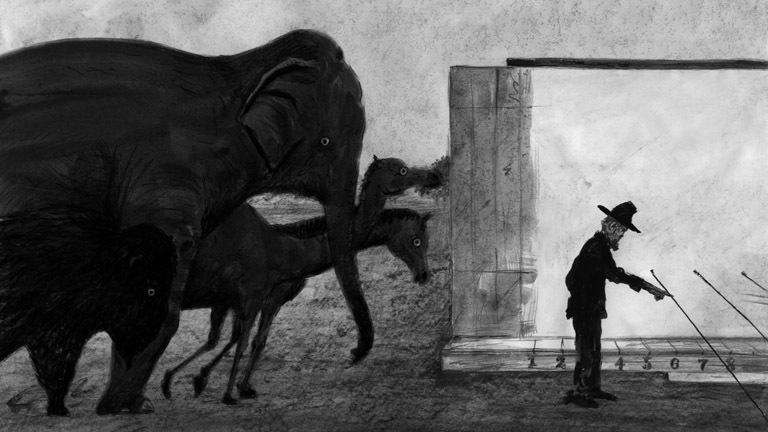 Muybridge’s Strings is a very complex film with many layers, and its selection fit well in the overall RICA 2014 programme which featured many other NFB productions and co-productions in both the official competition and in the special screening events. Nguyen pointed out that Yamamura considers himself an auteur, following in the footsteps of animators he admires such as Jacques Drouin, Ishu Patel, Yuri Norstein, and Priit Pärn. He is also an advocated for animation. 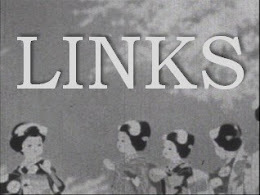 In addition to his teaching, he set up the collective Animations: Creators and Critics, in order to raise awareness about independent world animation. Nguyen also presented the works of two animators who were mentored by Yamamura. Masaki Okuda is a very talented young filmmaker and his award-winning film A Gum Boy (read review) shows a strong Yamamura influence. Atsushi Wada is a self-taught Kansai-based animator who had already developed a recognisable individual style (thinly drawn lines, a muted colour palette and animal motifs) before attending the Geidai graduate programme. The Geidai programme took his work to the next level with his acclaimed graduate film In a Pig’s Eye (2010). Nguyen showed Wada’s Mechanism of Spring, which is one of Wada’s most exuberant films to date. 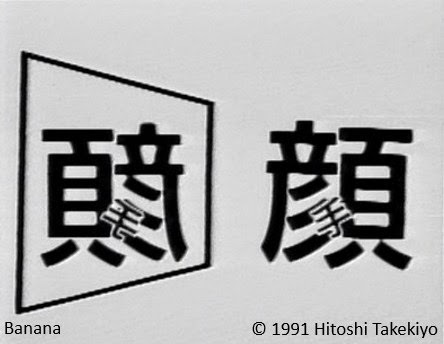 The selection opened with Banana (1991) by Hitoshi Takekiyo (竹清仁, b. 1967). A graduate of Kyushu Institute of Design, Takekiyo founded the KOO-KI collective of designers and directors in Fukuoka in 1997 and his most recent success was the animated comic short After School Midnight (2005) which was extended into a full-length version After School Midnighters in 2012. He parted ways with KOO-KI in 2012 and founded a new independent production company Mt. Blanc Pictures. Takekiyo’s specialty is computer animation. His early work Banana, which won a Special International Jury Prize at Hiroshima 1992, is part of the MoMA collection. It brings Chinese characters to life through movement and sound, performing the words that they signify. People, 人, rush about busy streets, while hands 手 perform actions, and so on. It’s a great little film that really ought to be shared more widely and not hidden away in an archive. Next, Nguyen presented the work of two graduates of Tamabi (Tama Art University). 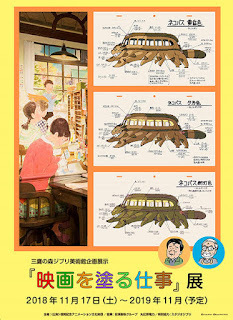 Tamabi’s animation programme, under the guidance of the late Prof. Masahiro Katayama and current mentor Prof. Tatsutoshi Nomura (野村辰寿, b. 1964), has produced many outstanding animators including Akino Kondoh, Mizue Mirai, and Oscar-winning director Kunio Katō (加藤久仁生, b. 1977). 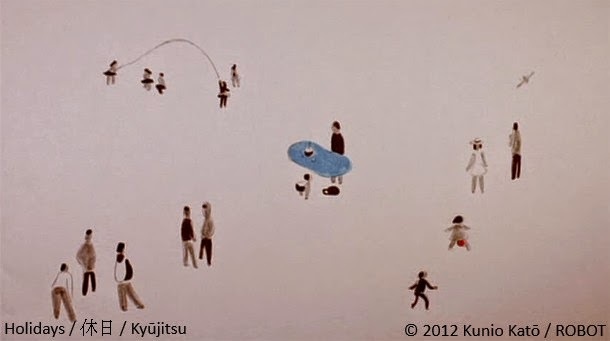 Katō is of course most famous for La maison en petits cubes (2008), but Nguyen presented a series of steam-of-consciousness short-shorts called Scenes that Katō made for his travelling exhibition in 2012. Read my review here. Osamu Sakai (坂井 治, b. 1977) is Nomura and Katō’s colleague at their company ROBOT. Although his films regularly screen at international festivals his work is lesser known abroad. 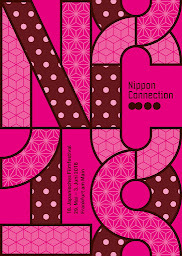 In Japan his work has been seen on the popular, long-running NHK programme Minna no Uta. Nguyen had hoped to screen Hitogata, but due to availability we were shown Digital instead. Digital is a montage of hand drawn geometric shapes. The film made the 2013 Official Selection at Annecy. 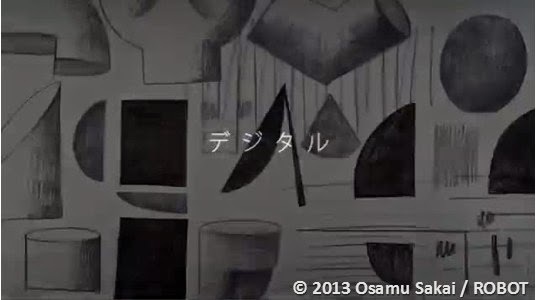 Samples of Sakai’s work including Digital cane be screened on his YouTube channel. 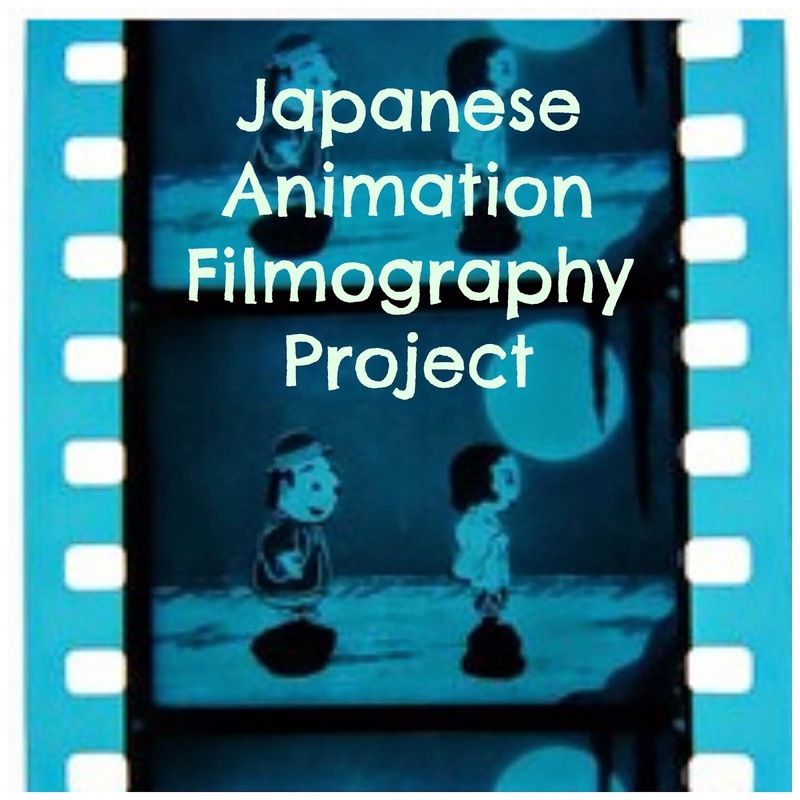 On the whole Nguyen presented an engaging programme of films, many of which I had not had the opportunity to see before, and posited some interesting ideas about auteurism and animation in Japan. My only criticism was that the programme did not feature any women animators. For the first generation of indie animators, women tended to take a backseat to their male colleagues. 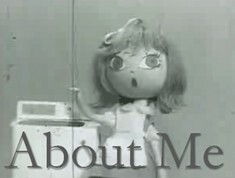 To be fair, Nguyen did mention that Renzō Kinoshita was not an individual auteur but an artist who worked in a partnership with his spouse Sayoko Kinoshita, and he also mentioned the team effort of Tadanari Okamoto’s studio, which featured the talents of puppet maker Sumiko Hosaka and puppet maker / animator Fumiko Magari. 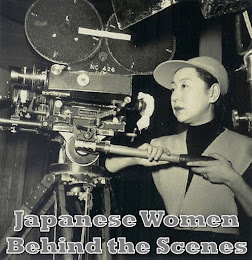 However, the final programme of animators from the 2nd and 3rd generations of indie animators did not reflect the fact that a growing number of women have been making a name for themselves as auteurs. 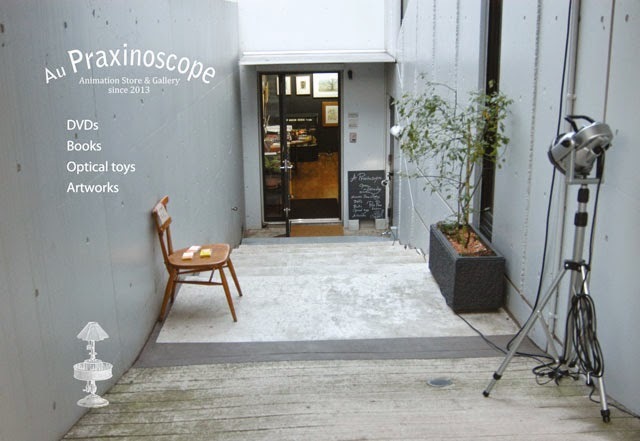 The Germany-based stop motion animator Maya Yonesho (learn more) has been exporting her unique brand of animation worldwide with her Daumenreise (Thumb Travels) workshops and although lesser known overseas, Reiko Yokosuka’s sumi-e animation is truly beautiful. The most exciting news is that the promise held by the current generation of women animators. 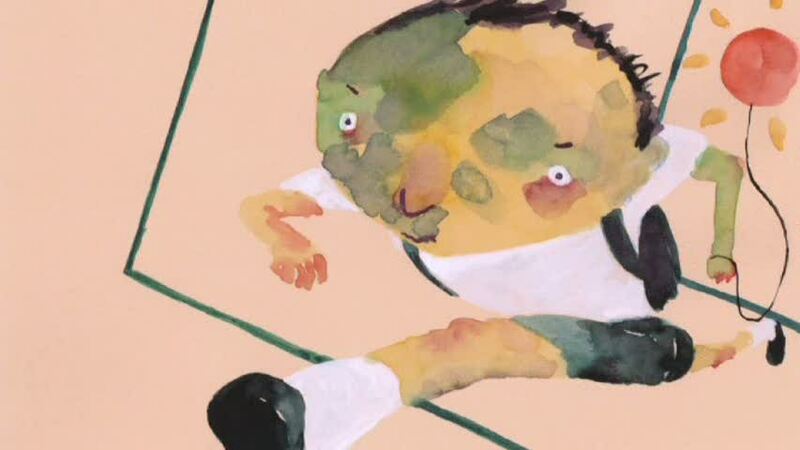 For example, Yoriko Mizushiri, a graduate of Joshibi University of Art and Design, has been a festival favourite in recent years and Akino Kondoh makes amazing animated shorts. I also observed at Hiroshima 2014 that Geidai’s post-graduate programme in animation, where Nguyen works, has a majority of female students. Some auteurs in the making include Saori Shiroki, who was in the first cohort of graduates alongside Atsushi Wada, as well as Yuanyuan Hu, puppet-animator Aya Tsugehata and Maho Yoshida from the 3rd graduating class. Yewon Kim and Yangtong Zhu are two real stand-outs from this year’s crop of graduates. I was delighted to discover that Kansai animator Mika Seike, whose work I discovered at Image Forum in 2006, has joined the Geidai animation programme. That means we can expect two short films from her in the next two years. Her works have a unique aesthetic that really appeals to me. As Nguyen said during his presentation of animation auteurs of recent decades, there has been a veritable explosion of talent on Japan’s indie scene since the turn of the century. Every year brings exiting new films and interesting young talent. Nguyen’s presentation gave a peek at some of Japan’s hidden gems both past and present, and whetted my appetite to see more works by many of these fascinating artists.